What does the word prowess mean as it is used in paragraph 11? "The rope came to snaky life in his hand." 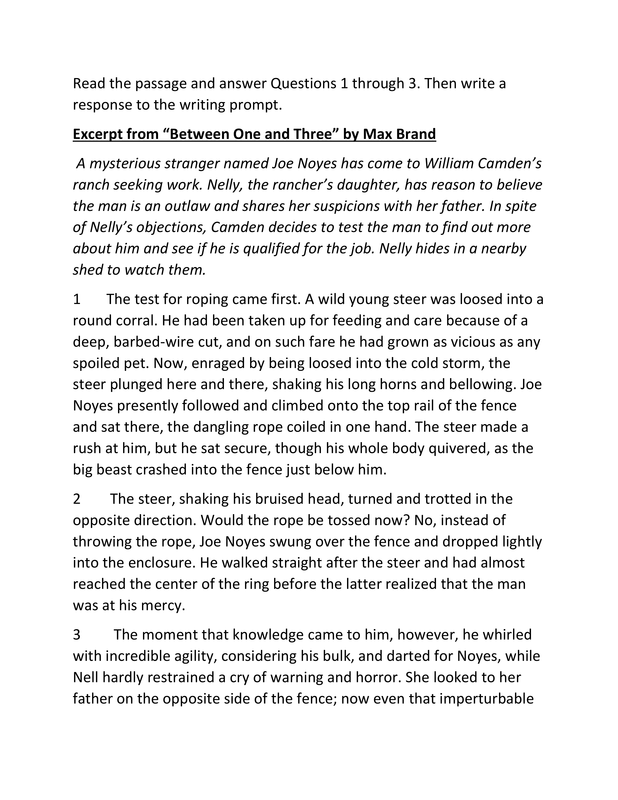 How does the author use this description to develop the character of Joe Noyes? A The description supports the idea that Noyes is in great danger. B The description illustrates the great skill that Noyes has with the rope. C The description reinforces the idea that Noyes may be too hesitant. 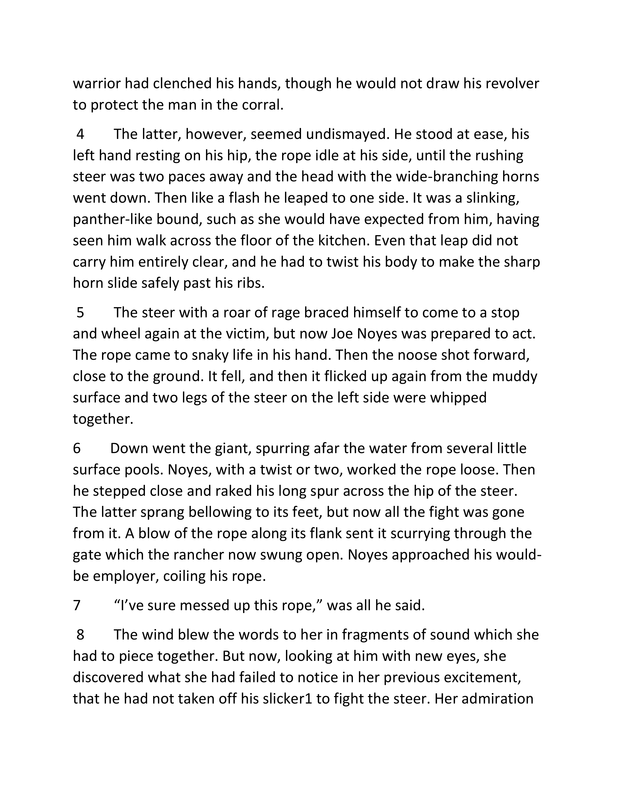 D The description shows that Noyes is too frightened to use the rope effectively. Which statement best describes how paragraph 14 contributes to the aesthetic impact of the passage? 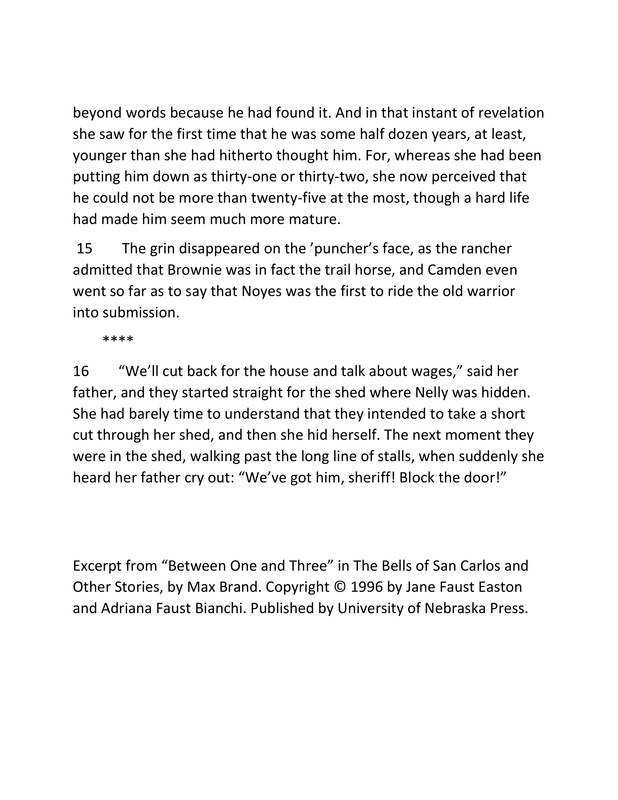 A By demonstrating how Nelly's perception of Noyes has changed for the better, the paragraph leads to the reader's surprise at an unexpected ending. B By slowing down the pace of the story, the paragraph provides details that allow readers to better understand how Nelly thinks. 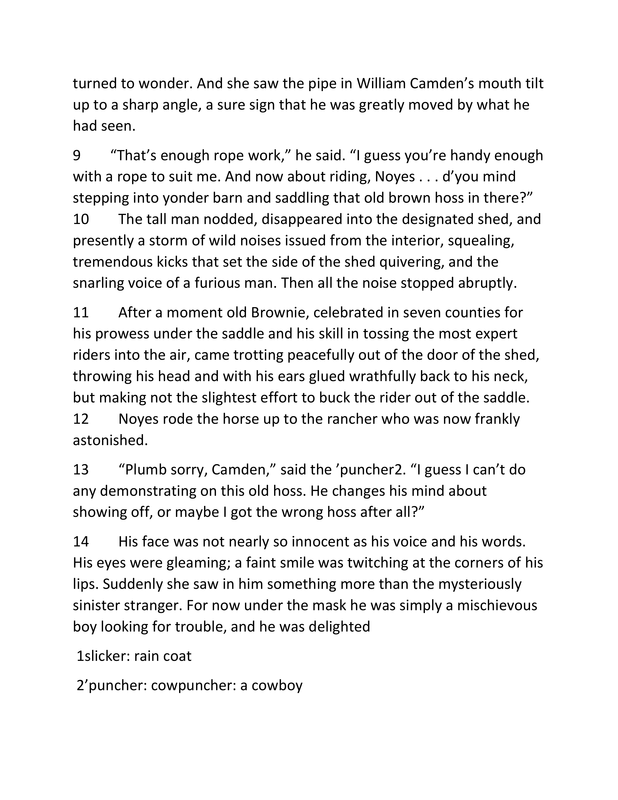 C By focusing on Noyes's physical appearance, the paragraph establishes a contrast between the youthful Noyes and the aging rancher. D By showing the conclusions that Nelly draws about Noyes, the paragraph provides important commentary on the hardships that young people face. What does the phrase, "twisted apparitions", mean as it is used in paragraph 2? Why does the author include information about Einstein's Theory of Relativity near the beginning of Passage 1? A The theory would have considered dark matter had Einstein been able to study the effects of gravitational lensing. B The theory was disproved by the weak lensing images of an Einstein cross captured by the Hubble Space Telescope. C The theory is the foundation for scientific developments that led to using a gravitational lens to study a supernova. D The theory led to predictions about supernovae that are different from what has been observed through the Hubble Space Telescope. How does the author's use of enshrined in paragraph 22 impact meaning in Passage 2? A It highlights the precious nature of scientific discoveries. B It suggests that the dicovery by Einstein is deeply respected. C It demonstrates the importance of recognizing scientific discoveries. D It indicates the difficulty that Einstein experienced when making his discovery. How does the connection made between gravitational lensing and the observation of SN Refsdal impact meaning in Passage 2? A The connection demonstrates how much of the universe still has not been discovered. B The connection provides an opportunity to praise the work of highly regarded scientists . C The connection reinforces the difficulty involved in discovering new features of the universe. D The connection leads to the suggestion that even greater discoveries about the universe are possible. The following item has two parts. Answer Part A, then answer part B. Which sentence best summarizes the central idea in passage 2? A A distant supernova has been named for a scientist who studied gravitational lensing; a supernova that was visible in the past will be visible again in the future. B Astonomers are successfully using the Hubble Space Telescope to dicover new types of supernovae; a supernova has resulted in a formation known as an Einstein cross. C Galaxy clusters sometimes serve as a natural magnifying glass for objects behind them; scientists have seen multiple images of a supernova in deep space. D Scientists are using computer models to make predictions about the universe; it becomes easier to see distant objects when they are viewed through gravitational lenses. How are these central ideas developed in the passage? 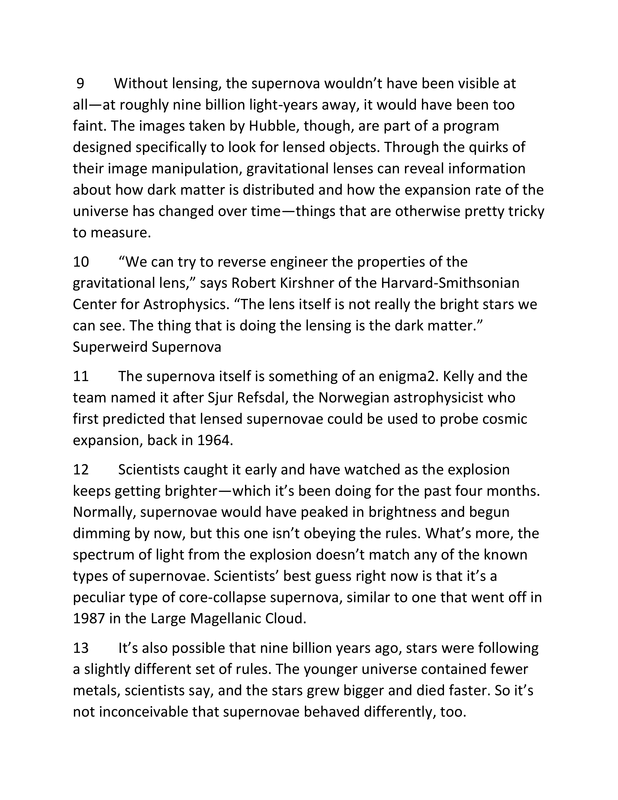 A Paragraphs 16-19 explain how the supernova's position in relation to a galaxy has caused the supernova image to appear 4 times. 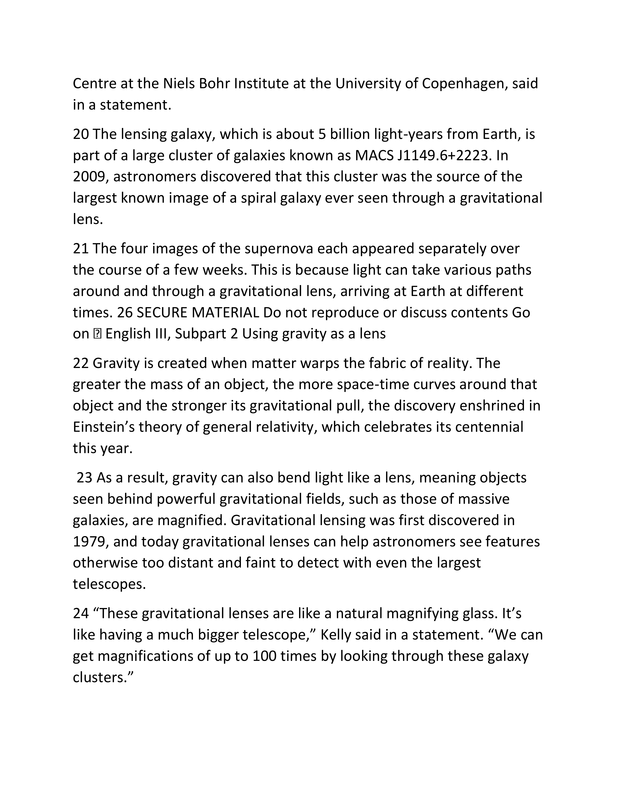 B Paragraphs 17 and 21 provide a detailed description of the Einstein cross to show the usefulness of the Hubble Space Telescope. 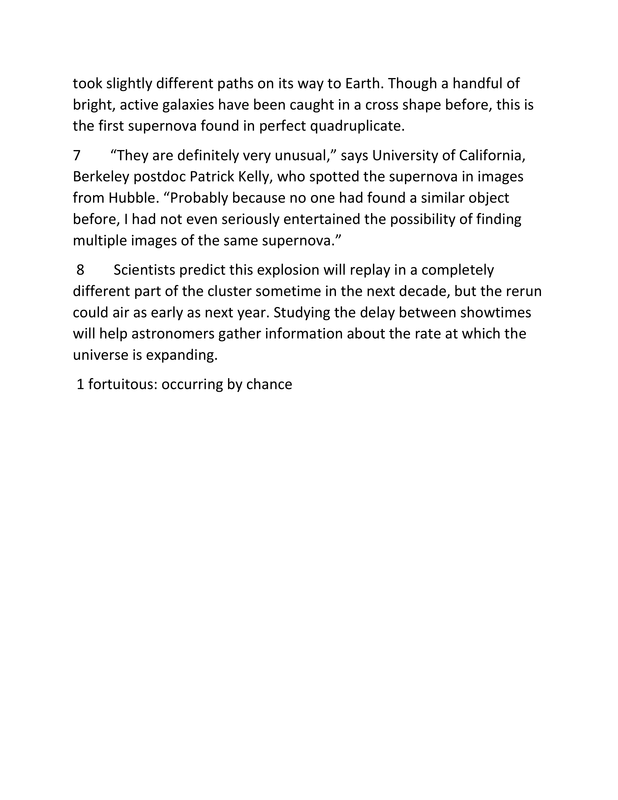 C Paragraphs 19 and 27 refer to the supernova by name, and paragraph 29 explains when it is likely to be visible again. 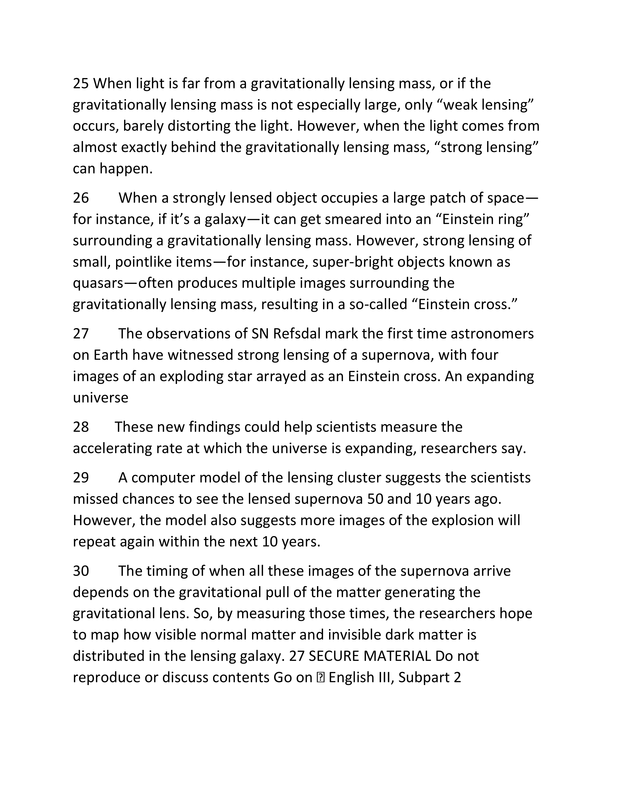 D Paragraphs 22 through 26 describe unique effects created by gravity, and paragraph 27 provides an example of its effects. The following item has two parts. Answer Part A and then answer Part B. Which claim do authors of both passages make? A The current methods of gravitational lensing need drastic improvements. B The use of gravitational lensing will provide scientists with more knowledge about the universe. C The most important discoveries are made when scientists can exercise perfect timing. D The practice of gravitational lensing is most useful when used with computers. How do authors develop the claim in both passages? 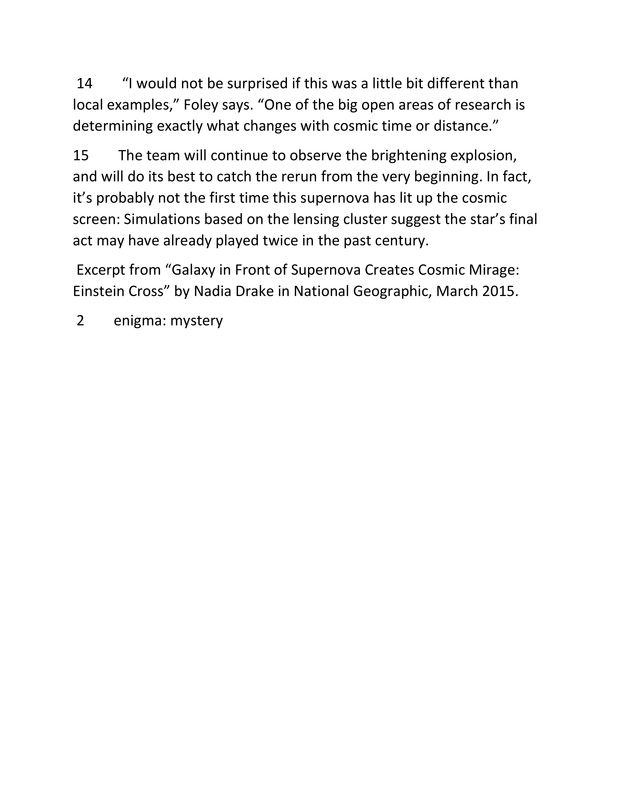 A by describing scientists' plans to learn more about dark matter. B by noting that scientists will have multiple attempts to study the same event. 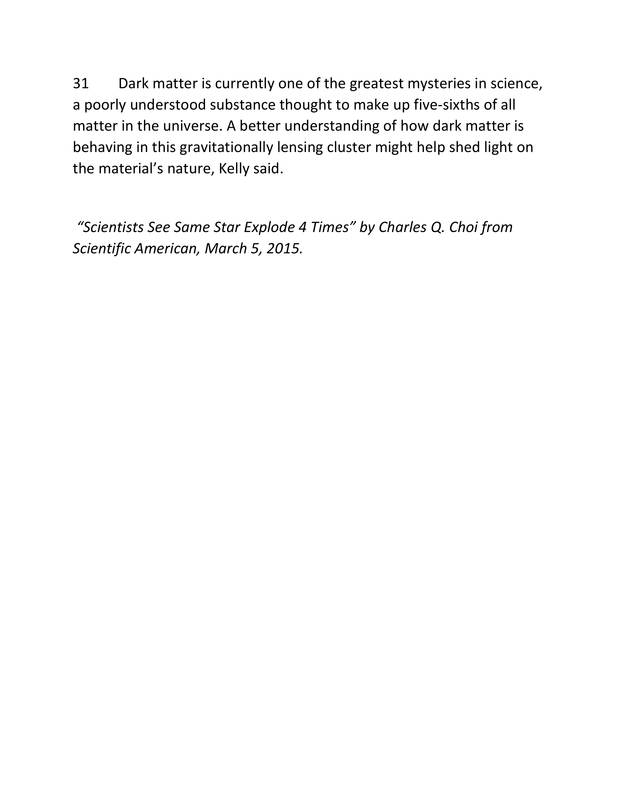 C by explaining how light is impacted by gravity from a star or other large mass. D by providing an explanation of how lensing can improve telescopes. How does the presentation of ideas in the passages impact meaning? 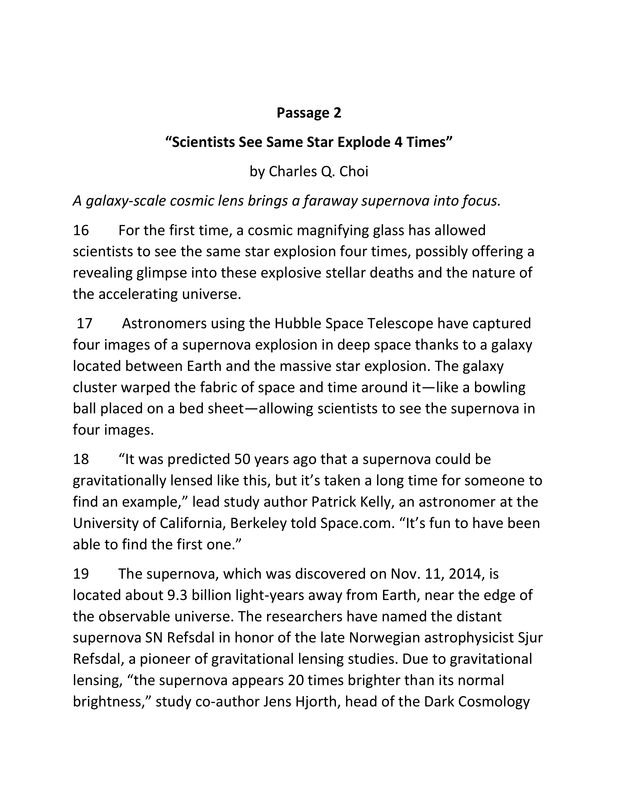 A Although both passages begin by contrasting a lensed supernova with other distant objects unaffected by gravitational lensing, passage 1 speculates about the cause of the supernova, while passage 2 describes its possible future effects. 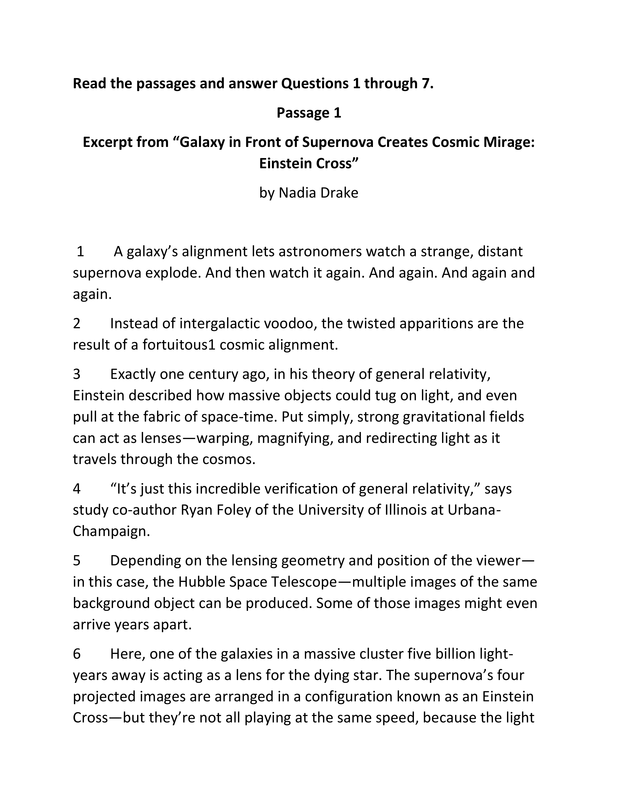 B Although both passages begin by establishing that gravitational lensing has led to the discovery of a distant supernova, passage 1 gives additional information about the supernova, while passage 2 provides a detailed explanation of gravitational lensing. C Both passage 1 and 2 define gravitational lensing, and then give various examples of how it has affected objects in space. D Both passage 1 and passage 2 describe the main problem astronomers face when attempting to study distant objects, and then explain how gravitational lensing provides a partial solution to that problem. What is the literal meaning of, "...a pane of glass," in line 10? How does the use of figurative language impact meaning? A It emphasizes the beauty of the winter landscape. B It illustrates how much apple picking still needs to be done. C It illustrates the harsh conditions faced by the narrator. D It emphasizes the dreamlike quality of the narrator's thoughts. What do lines 9-15 suggest about the speaker? A He has begun to see the world in a different way. B He has become mentally and physically weak. D He has concerns about how the coming winter will affect his apple trees. How does the development of the speaker's character impact the meaning of the poem? A It adds relevance to the poem's ideas about life. B It presents the poem's ideas about life in a dramatic fashion. D It provides an opportunity to question the poem's ideas about life. 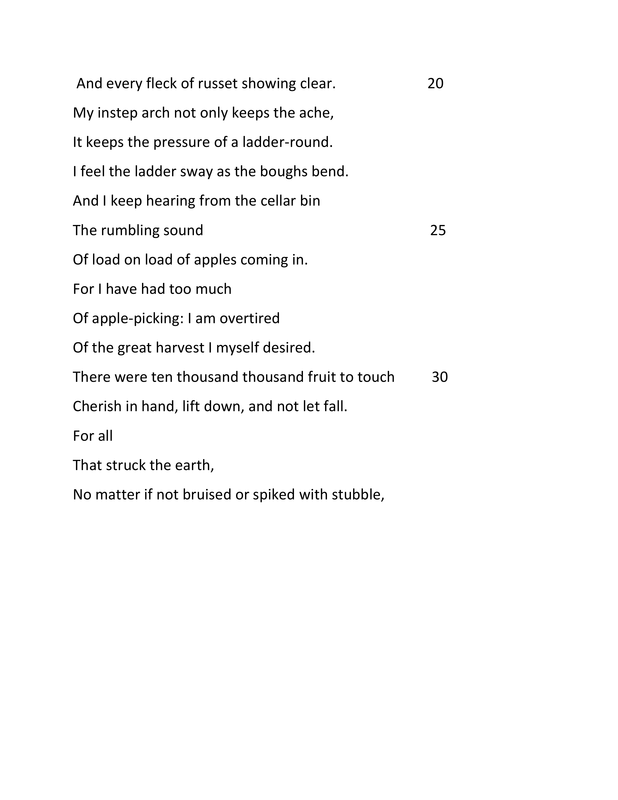 What do the unfilled barrel and unpicked apples symbolize at the beginning of the poem? A The speaker's decision to make a change. B The speaker's dreams that were never realized. C The speaker's belief that he will return soon. D The speaker's desire to leave something behind. 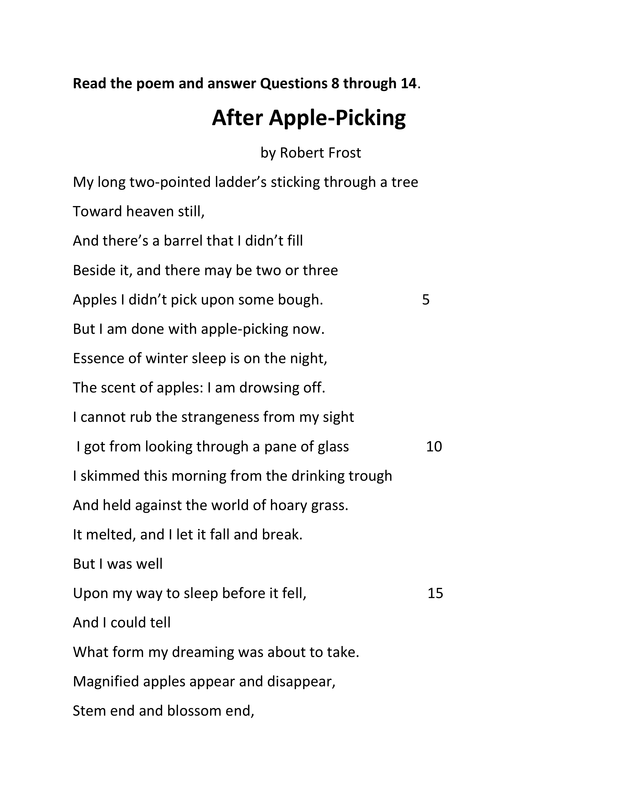 For I have had too much/ Of apple-picking: I am overtired/ Of the great harvest I myself desired. Which sentence best states the intended effect of this mataphor on the meaning of the poem? A The speaker's lack of interest in the great harvest signifies a change in the speaker's perspective on life. B The speaker having picked too many apples represents the shame about misguided actions. C The speaker's mention of the great harvest emphasizes the overwhelming task of gathering apples before they rot. D The speaker being too tired indicates the speaker's intention of having a peaceful night's sleep. How does the speaker’s prediction of his future dream help develop a theme of the poem? A It shows that the speaker is beginning to look back on what he has done in his life. B It explains why the speaker has decided to end the harvest before it is complete. C It demonstrates the deep sense of pride the speaker feels for what he has accomplished. D It illustrates the speaker's changing feelings about his apple crop as the harvest finishes. How do lines 30-38 help develop a theme of the poem? A They reveal the speaker's concern that others may do his work improperly after he dies. B They suggest that the speaker may regret some wasted opportunities. C They reveal that the speaker was once a greedy man but has changed his ways. D They show that the speaker has accepted how his life turned out. Which of the following is a central idea expressed in the poem? A The speaker wishes he had chosen a different profession. B The speaker understands that he is reaching the end of his life. C The speaker worries that he will not be able to finish his work. D The speaker reflects on good and bad memories in his life. 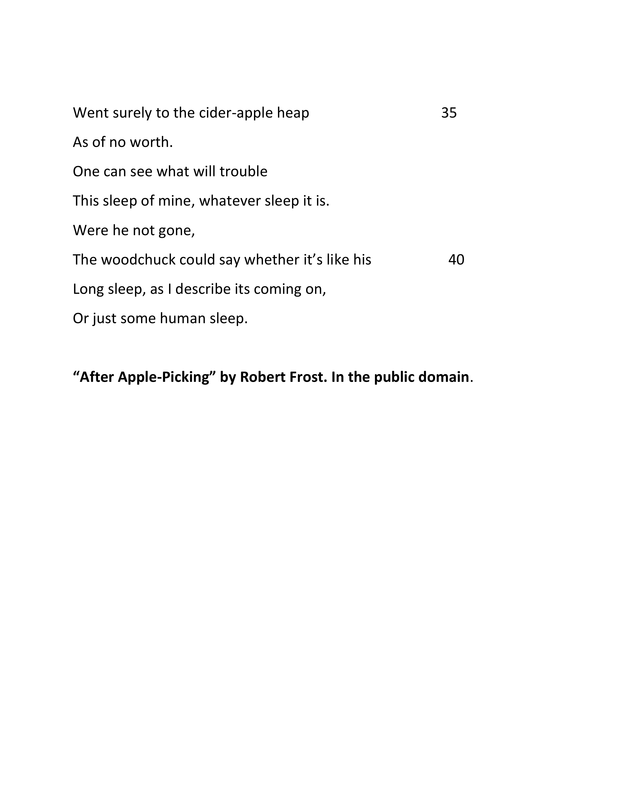 Which two excerpts from "After Apple-Picking" best support the correct answer in part ? Which change, if any, is needed to the underlined text. 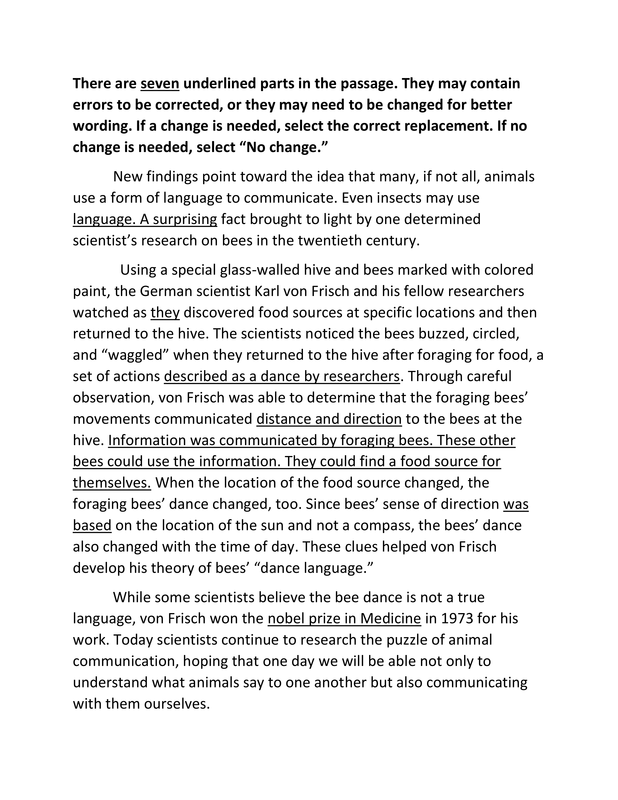 Which change, if any, shows the best way to revise the underlined text? Information was communicated by foraging bees. These other bees could use the information. They could find a food source for themselves. A These other bees could then use the information communicated by the foraging bees to find the food source themselves. B The information by the foraging bees could be communicated and used by these other bees that could find the food source themselves. C The foraging bees communicated information, and it was used by these other bees to find a food source for themselves. Which change, if any, is needed to the underlined text?